Three days ago I got a pain in my neck. I could also say that the pain was located on my shoulder because the centre of the pain was vertically positioned near the back of my spine on top of the shoulder however more towards my left shoulder. It started to appear four days ago when I had a chat with my DIP course buddy and increased the next day after I had a chat with my flatmate about the struggle that I am facing with. And it is about being attracted to different sources of information and way of explaining how this existence works. But what troubled me the most was that if I would want to fully understand what each of the sources are actually saying, I would have to dedicate my time to completely integrate the information. And this could be the reason for the pain as the reflection of feeling burdened by the challenge of wanting to understand the truth about the functioning of the whole existence. I also found the audio that explains the crick in your neck as related to pattern of looking up to people and looking down on other people and yourself contributing to inequality within leader-follower relationships. Initially I expected that it would be most supportive for my pain in the neck to write with focus on the point of overwhelmingness however it seem that it would be best to write about who I am looking up to and also down on. Which totally makes sense because in my life it was my father that I started to follow and look up to and I guess all children start with their parents being the first examples where they copy most of their behaviour patterns from. The problem is when the parents do not consider their children as equals but look down on them and even suppress them due to fear that children will become more than them and will thus loose the power of controlling them. And such was exactly the case in family of my parents where especially my father wanted to be something more and did often criticise me for every single small mistake that I made. This resulted in me not developing sufficient self trust and habit of looking inside me for a reference point about my decisions in life. The message that my father has been embodying is to be productive in terms of accumulating a lot of physical proof of your ingenuity so that it can be shown to the world for the purpose of others looking up to you and thus feeling good for being something more. Such starting point of course prevented him to strive for excellency in terms of perfecting his attitude towards his work thus the final products show mediocracy and carelessness. For example when he is creating replicas from medieval ear he does not make effort to strictly follow the use of materials and designs that were used at that time. He usually adds something that does not belong there and cuts corners to save cost and time. So he is not striving for high quality but mostly for the quantity. And if I look at where I have copied such pattern from him I see that while I am focused more on creating the future and am using technologically advanced tools like computers, I too lack the perfection in studying how this existence functions and am to some extent superficial in my research. I do not go in depth and am not investing enough time and effort to integrate the information more effectively. And there are some other points that prevent me from integrating information from sources that I stumble upon. First is that I have studied many traditions and authors that explain how this existence works and later I have discovered information that proved them wrong. The reasons were because they have misinterpreted their experiences, they were fooled by the creators of the existence or they were their agents that incarnated here specifically to deceive humanity and redirect us towards the dead end. Thus I developed the mistrust and suspicion about everything that I see, hear or listen since the levels of deception can exist beyond by awareness. Also what I learned is that while some pieces of the message seems to be valid, all the messengers that I have been studying from are not without faults. They are equally individuals in the process of self-perfection and sometimes something that they do or say is far from being valid. As I learned, we have all ben preprogrammed to be followers to some extend and are constantly searching for someone to look up to. And we lack the ability to look into ourself and find a reliable point of self-trust for the purpose of always being able to distinguish the truth from deception. Thus I have also wanted to find The Source, The Leader that I could follow blindly and just unconditionally absorb all the information without having to use any discernment. However as I realised this is not the possible way of existence to function since we must all learn to develop self-responsibility and instead of relying on someone outside of us to develop real self-trust and ability of common sense. We must not just learn from one single source out there but must research them all end keep what is good. While there are some who lead the path of discovery about how this existence works, it is not enough to simply accept their teachings. We must reach the same awareness by walking the equal path of researching and testing and coming to our own conclusions. We can not gain the same awareness just by becoming their dedicated followers. I forgive myself that I have accepted and allowed myself to believe that there are individuals existing who have all the answers about how existence functions and that I just need to find them and all my problems will be solved. I realise that I can not be sure if such individuals exists and that instead of just searching for someone that knows it all it would be best to learn from those who can explain this existence to a very large extend and combine the information to get the full picture. I commit myself to when and as I am wondering about the secret of the existence and my mind in producing thought like: “I must find the personalised manifestation of the god who will answer to all my questions!” to stop and breathe. A then learn from what other wise people have also provided explanation about and use such knowledge to expand my awareness. I forgive myself that I have accepted and allowed myself to believe that awareness is a gift of god and that god created some of us with lesser awareness and some individuals with higher awareness. I realise that that I am increasing awareness by researching and learning and that while we all have our unique characteristics those who have reached high level of awareness have evidence that they have also walked a long and dedicated path of research and experimentation where they used own ability of discernment to separate facts from deception and created their own understanding about how this existence functions. I commit myself to when and as I want to know the deepest meaning of life and my mind goes like: “I must just believe that I am a good person and god will eventually enlighten me and gift me with higher level of awareness.” to stop and breathe. I then use the god's gifts in form of already available knowledge and use it as best as possible to discover the secrets of existence. I forgive myself that I have accepted and allowed myself to look up to individuals who have achieved a lot in life and making them more than me while believing that I will never be able to reach their level of greatness. I realise that by creating such inequality I am making me less than others and thus the consequences like the crick in my neck are created. I commit myself to when and as I am learning about the people who have achieved great things in life and my mind is saying: “You must become humble in presence of their greatness and admire them due their incredible achievements!” to stop and breathe. I then research their life path and all things that influenced them in order to become capable of such achievements within understanding that we are all different with unique life path and we can all excel in our own way to expand ourselves as much as possible. I forgive myself that I have accepted and allowed myself to desire to be great and be admired by others in order to fell good and receive what I want from others in my life. I realise that by such desire I equally create inequality and by looking down on others I equally create also undesired consequences that can be experienced as the crick in my neck. I commit myself to when and as I decide about what I want to do in my life and my mind is like: “You must learn about the most advanced knowledge available so that others will look up to you and think that you are a genius.” to stop and breathe. I then continue to satisfy my curiosity about the secrets of life while understanding that we are all parts of the same existence and that I must also stay humble and share my discoveries with others in order for all to improve their lives as one and equal. I forgive myself that I have accepted and allowed myself to be a hoarder of knowledge and information in order to accumulate as large amount of advanced knowledge as possible and display it in front of the world in order to be admired and to feel good about my achievements. I realise that life is not about quantity but about quality and that we can all live in abundance if we share available resources including knowledge equally. I commit myself to when and as I want to know more about things that I am still not clear about and my mind is telling me: “Gather all kinds of information from as many sources as possible in order not to miss something that could be very important!” to stop and breathe. I then with understanding that each of us has a limited time available and that it is not possible to absorb all information out there to rather search for the most reliable sources of information and make sure to integrate the information to the level where I will be able to retain them in my memory for a long time and be thus able to share them with others and function as a useful member of our society. I forgive myself that I have accepted and allowed myself to experience resistance when I study different sources of information due to understanding that there are all kinds of illusions and deceptions out there and that eventually all information that I now think is the truth can later be proven to be a lie. I realise that the nature of evolution is expansion of awareness where previous concepts and perspectives are eventually overwritten with a new understanding of reality. I commit myself to when and as I learn about this existence and my mind is producing thoughts like: “Use discernment and be careful about sharing the information since in time it can be proven as false and other people will judge you and be angry about you so protect yourself and keep quiet!” to stop and breathe. I then rather share my current discoveries with others and allow to be proven wrong since only by sharing our perspectives we are able to assemble peaces of information into a full picture and attain complete awareness about the whole reality of existence. I forgive myself that I have accepted and allowed myself to believe that I am incapable of distinguishing between what is real and what is not and that I will be able to discover the truth of reality only by listening to individuals who are speaking eloquently about the nature of creation. I realise that we all have a reference point within us that can be used for discernment and if applying complete and total self-honesty we can attain the capacity to always know what is truth and what is deceptions. I commit myself to when and as I am researching this reality and my mind is telling me: “Reality can never be understood fully since only god possesses such ability and you are definitely not god!” to stop and breathe. I then within realisation that we are all parts of the same creator and made by his own image and thus also gifted with capacity of reasoning I continue to develop the capacity of self-honesty in order to always be able to rely on my inner guidance when having to distinguish facts from false information. I forgive myself that I have accepted and allowed myself to become frustrated when learning about something new and I am not completely clear about certain points. I realise that askKing is the King and that I am always able to ask questions and receive additional explanations so that eventually I can attain complete clarity about the subject. I commit myself to when and as I am digesting a new body of information and while stumbling about some point that I am not clear about an my mind is going like: “It is pointless to ask questions at this moment and waste time because there is so much additional information available and you will probably get your questions answered by simply continuing to digest the rest of the information available.” to stop and breathe. I then rather write down my questions to become completely clear what I am not sure about and make the effort to verify if answers to such questions actually are provided in some other body of information that already exist because there is always also a possibility that such questions have not been answered yet. I forgive myself that I have accepted and allowed myself to experience resistance about sharing my perspectives to others due to fear that others will start asking me a lot of questions that I do not know the answers to and thus I will feel embarrassed. I realise that others questioning me is actually a blessing in disguise because they push me to expand myself where eventually I become the beneficiary due to increased awareness. I commit myself to when and as someone is asking me a question and my mind is like: “Oh no, they have discovered some fault in me and I must be ashamed of not being perfect.” to stop and breathe. I realise that we all have yet to discover many things and by others asking me something they are actually assisting me to quantify the process of self-realisation so I am from now on receiving and answering any question with great appreciation and gratefulness. I forgive myself that I have accepted and allowed myself to search for the ultimate source of information about all the existence and then be disappointed when I discover that the source has lacked to explain many things that I would like to know about. I realise that there are different reasons for that. One is that each source has a limited capacity of serving information and each source must decide what information to present based on the priorities of the receivers of the information. Then even if the source has all the answers about this existence, the source may act within awareness that many recipients or the humanity in general are not yet capable of handling them and would cause the overwhelmingness, panic and other undesired and harmful consequences if much more advanced information would be shared. I commit myself to when and as I study from certain source of information and my mind goes like: “I see that this and that is lacking to be explained thus this source is no good and I should better find another one that already has all the answers.” to stop and breathe. I then make best use of the available information and fully integrate them and then also equally share them with others with consideration of the capacity of understanding in order for me equally not to create harmful consequences for others. 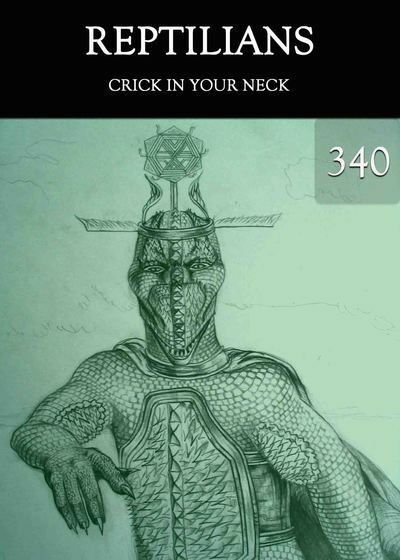 In relation to this blog post, I invite you to assist also yourself with awesome self-perfecting tools within free online DIP Lite course and to listen to educational audio titled Crick in Your Neck from the Reptilians series at Eqafe web store with hundreds of extremely supportive educational items that hold answers to many about life and this existence.